The financial sector pays special attention to people who have financial problems in society. The basic bank service ensures that everybody has at least a current account. Micro-financing tries to open up lending to people for whom the traditional avenues are closed. The financial sector must ensure that the increase in the digitalisation of products and services will not make people fall behind in the future. It may occur that a customer cannot open a current account because of his financial situation, or because his previous accounts have been closed. Without a current account, however, it becomes difficult to pay bills, for example, or to withdraw money. To give everybody an opportunity to make payments, the basic bank account has been legally regulated since 2003. This service ensures that every consumer in Belgium is entitled to a current account, at a maximum cost of €13.97 per year. This basic bank account is subject to a couple of conditions: a consumer is not, for example, allowed to have more than €6000 in savings or loan contracts and must not have committed any crimes. In 2011, 12 financial institutions registered 1095 new basic bank services, and since 2003, this figure has amounted to 8,605. In all those years, a basic bank account was refused only 8 times, because the requester already had a current account. 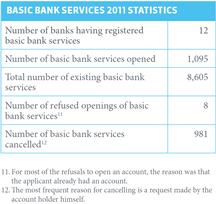 In 2011, the Mediation Service did not receive any complaints about the basic bank service. 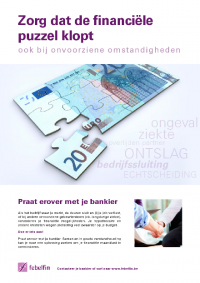 Belgium is considered to be a standard in the field of the basic bank service. On 18 July 2011, the European Commission issued a non-binding recommendation to encourage EU countries to offer a basic bank service to every EU citizen. This recommendation was largely based on the Belgian model, and many provisions from Belgian legislation were adopted integrally. Via micro-financing, people who wish to start up a business and have difficulty obtaining a loan via the normal channels (unemployed people, for example) can nevertheless be helped along with small loans, typically up to approx. €10,000. Besides financial support, micro-financing institutions (MFIs) also provide training courses and advice to budding entrepreneurs. In Belgium, but also abroad, start-up businesses and small-scale local initiatives are supported this way. MFIs abroad mainly aim to fight poverty, whereas in Belgium they wish to grant loans to persons who are excluded from the traditional banking system. Banks do not offer micro-loans, but they support these initiatives via a partnership with micro-financing institutions. The product and services offer that the financial sector provides is increasingly digitalised and automated. Internet banking, self-banking, etc., have the major advantage that everything is faster, cheaper and often easier. Nevertheless there is a growing group of people who cannot handle this technology. It will be a challenge, therefore, for the financial sector to prevent the digital gap that is coming about from excluding these people financially. Some unforeseen circumstances such as losing one’s job or being ill for a long time, may affect someone’s financial resources. All of a sudden, a mortgage credit or any other credit will bear on the person’s budget to a far bigger extent. Also in that case, the bank will look for a solution together with the person concerned. One of the possibilities consists in reducing the monthly instalment. As for mortgage credit for example, several possibilities exist. ‘Prevention is better than cure’ is a saying that also applies to financial matters. There is a vast array of guidance programmes for people in financial trouble. These programmes make it possible to take action in order to prevent the situation from getting worse. 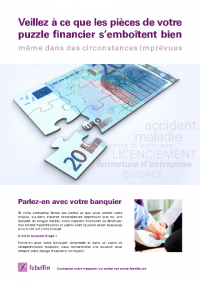 The public authorities also provide the possibility of a free insurance in case of loss of income. Especially when someone raises a credit, it may be wise to take out such an insurance.